A recent social media post showed step-by-step video instructions on how to give your Easter eggs a marble effect using shaving cream. It looked fairly simple, which piqued my interest. 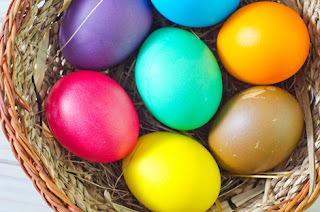 Finding hacks that make the annual egg decorating ritual not just efficient but with uniquely attractive results that are guaranteed to enchant the aesthetic senses of little ones, has become a bit of a goal the past few Easters. With mixed reviews. Some in the past were not exactly as advertised, but they had to do. It wouldn't be Easter without those colourful eggs. Images of this holiday turn minds to Spring - from the aforementioned tradition to the season's soft pastels and vibrant hues, fluffy chicks and bunnies, the elegant lilies and for us older folks, to recollections of white patent shoes and pretty straw bonnets with satin ribbons. We see these images in flyers for Easter egg hunts, promotions to inspire a freshening of the wardrobe or bulletins for local events. The internet offers unlimited resources for people to step outside their imaginings and discover boundless supplies of clipart and photos themed to all of these cheery subjects for use in personal and business projects. However, when it comes to finding the right images for these, not everyone wants to go shopping online for the perfect examples. Image editing software has given a lot of people an option, providing a new outlet for everything from designing websites and physical products, such as cards and advertisements, to scrapbooking and collages, to altering photos or even to creating original illustrations. One's first thought on this, of course, might be that they lack the ability or the talent. For those looking for new challenges it's good to know that these days you really don't have to be a professional to give it a try. Nor do you need to invest in expensive programs. From tutorials to cost-effective software (even some free ones) you can find all the help you need to test your artistic abilities on the world-wide web. The diversity of tutorials also ensures that you can find something that doesn't just appeal to you but matches your skill level. Start slowly and learn as you go. From PSDDUDE this tutorial offers a simple way to create a a vector egg in Photoshop. Envatotuts+ outlines in an easy to follow step-by-step tutorial how to create a simple background with subtle texture and a few baby chicks. Celebrate the holiday of spring by making your own Easter-themed, vector postcard from Template Monster. A YouTube tutorial to guide you through the steps of making a realistic chocolate Easter Egg using GIMP. Another great chocolate Easter egg tutorial from Creative Tutorials, this time using Photoshop Elements. A simple tutorial from Fantasvale on YouTube to make a greeting card with the shape of an Easter egg. Another great tutorial from envatotuts+! Learn how to create flat Easter icons using Adobe Illustrator.